Here is a detailed list of upcoming events and opportunities referenced in the weekly announcement email - take a look and get involved! Sign up for weekly announcement emails at the bottom of this page. SWE-MN is a driving force for STEM education: we promote engineering to all within our community as we influence the next generation of engineers. By reaching out to all ages and all community members, we fill the pipeline with women engineers. We showcase strong technical women leaders and provide role models to aspiring engineers. SWE-MN is a respected advocate for STEM education and STEM policy issues; our community seeks out our expertise. We provide a message of engineering as a desired profession; we provide guidance in ways to encourage and advance young women in STEM. SWE-MN creates a community of support for women engineers at all stages of personal life and professional careers. We provide a cohesive and inclusive environment where members mentor and encourage each other. SWE-MN provides professional development opportunities for women engineers through a combination of meetings, seminars, conferences and webinars. Our network provides a forum conducive to sharing best practices, knowledge, and advice to foster leadership capabilities and achievement for our members. Our community includes corporations and employers; primary, secondary and post-secondary students, administrators, teachers and parents; our members and future members; working professionals and other professional societies; and greater Minnesota. Please see our Calendar for all upcoming events. E-mail secretary@swe-mn.org to get on our e-mail list to be informed of all upcoming events. Please visit the MFESTS (Minnesota Federation of Engineering, Science, and Technology Societies) website at www.mfests.org for more information on events at other societies. Event recaps can be found in our Blog. 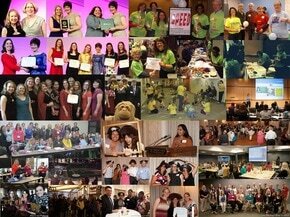 Past event photos can be found on our Outreach, Professional Development and Awards webpages, and on our Facebook Page.